Foundlings headline the Scared To Dance and For The Rabbits gig night at The Victoria. Entry is free and support comes from adults. 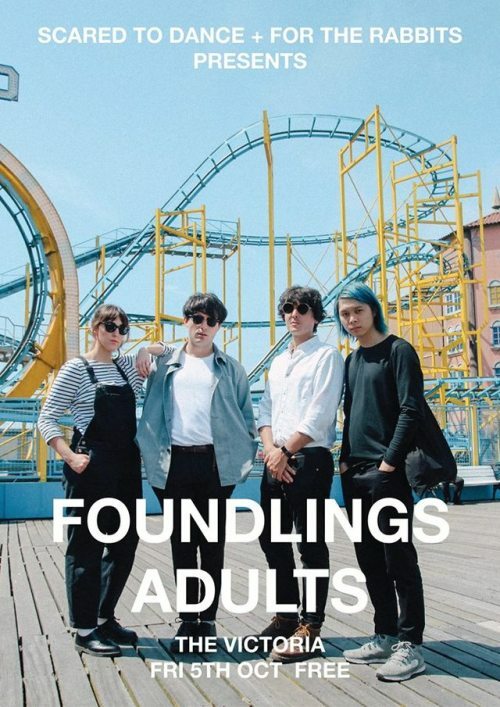 Foundlings are a South East London/Brighton based band who play melodic, guitar-driven, indie-rock music. The influences of the band range from post-punk and 80’s and 90’s indie to modern alternative jams, such as Parquet Courts, Courtney Barnett, Haley Bonar and Alvvays. The band self-released their debut single Misery in March this year receiving airplay from BBC 6 Music, BBC Introducing in the South and Amazing Radio. In July, the band completed their first UK tour in support of their new single Horizon. Foundlings are just getting started and they sound all the better for it. Indiepop quartet Adults came to the attention of many last year with MSN, their contribution to the Art Is Hard Singles Club. The band initially bonded over, "desperately trying to be adults and desperately trying to rip off other bands", however they soon stumbled upon their own sound, as showcased on their recent debut cassette, The Weekend Was Almost Always Over. Dealing in a similarly energetic and scratchy take on indie to bands like Los Campesinos! and Johnny Foreigner, Adults’ sound is built around wiry guitar-line, shout along girl-boy vocals and frenetic drum beats.